To make the pastry, place flour, butter and a pinch salt in a food processor and whiz until the mixture resembles breadcrumbs. Add ¼ cup (60ml) chilled water, then process until the mixture comes together in a ball. Enclose in plastic wrap and chill for 30 minutes. Lightly grease a 23 cm loose-bottomed tart pan. On a lightly floured surface, roll out pastry to 5mm thick, then use to line the tart pan. Chill for 15 minutes. Preheat oven to 180 degree C. Line pastry with baking paper and fill with pastry weights or uncooked rice. Bake for 10 minutes. Remove the paper and weights, then bake for 5 minutes or until dry and pale golden. Remove from oven and leave aside to cool. Heat the oil in a fry pan over medium heat. Add onions and 1 teaspoon salt, then cook, stirring occasionally, for 6-8 minutes until softened. Add Oakley's Premium Fresh beetroot, vinegar, thyme, brown sugar and 1 cup water, then cook for 12-15 minutes (stirring in between to prevent burning) until thickened and tender. Cool the mixture. 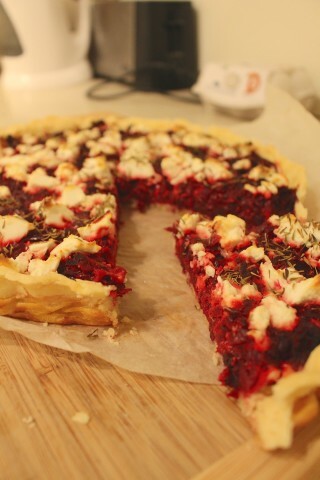 Spread beetroot mixture over the tart base, then crumble over feta cheese. Whisk egg and cream together, then pour into tart case. Scatter with extra thyme. Bake for 35 minutes or until set. Slice and serve with a leafy green salad.